Is Don Trump right about immigration? 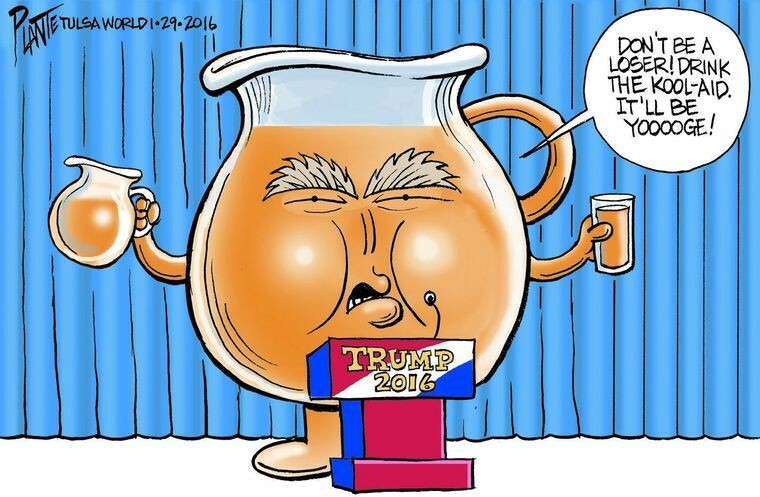 A note on the candidate’s oh-so tempting orange Kool-Aid. I recently returned to New York City from a two-week trip to Texas, where I was born, raised and (partially) educated. This was my first visit down south since the Republican “establishment” largely abandoned its bid to rob Don Trump of the party’s top spot. Suckers! While the Lone Star State is stained red on electoral maps dating back four decades, Texans, especially urbanites, have proven themselves much less susceptible to the real estate mogul’s controversial views on immigration, globalization, and … common decency. In fact, the most recent Public Policy Polling count gave the candidate a measly six-point lead over Clinton in the state — a surprising figure given Texas’ rich tradition of producing GOP commanders in chief. In the 2012 election, Texans gave Mitt Romney an almost 16-point lead over Pres. Obama. Don’t be fooled by the polls that I got. They’re still, they’re still loyal partisans from the block. They just don’t write songs about it. Hop on any Texas highway and all you’ll see is the residual goo from the weathered Romney-Ryan 2012 bumper stickers. Browse the FEC’s campaign finance records and things look quite different. 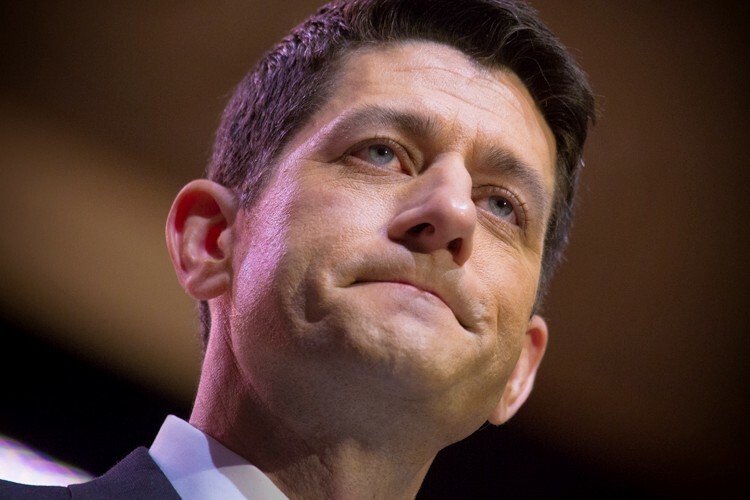 Even House Speaker Paul Ryan, one of the most prominent GOP anti-Trumpists has joined the “mum’s the word” movement. Image courtesy of Salon.com via Jeffrey Malet, maletphoto.com. Before my Texas trip, I hadn’t met a single (openly) Don Trump supporter. Not one. That being said, I had the fortune of spending the majority of my time in a small Central Texas town populated primarily by wealthy white retirees, many of them life-time GOP militants. While finding outspoken Trump supporters was still about as easy as getting someone to admit they like Nickelback (click the link - you’ll be glad you did), I was slightly surprised to find that a person very close to my family had metamorphosed into a serious Don Trump supporter, even making the one-hour trek to attend the candidate’s August 23 rally in Austin. This beloved individual is no dummy. I have a great deal of respect for him/her. He/she is a very insightful, Ivy League-educated professional who has traveled abroad and lived in many parts of United States. Sure. This person resents big government, gun control, high taxes and other conservative talking points, but he/she is the last person I would expect to develop a taste for Trump-flavored Kool-Aid. While I pledged to avoid the topic of politics during this trip (you have to pick your battles), I was lucky enough to listen in on many conversations with my loved one and his/her Trumpist comrades. It goes without saying that I disagreed with almost everything I heard — not least because it had less to do with policy and much more to do with sentiment. Don Trump’s non-teleprompter days limited his “speeches” to on-the-fly remarks about how different groups and institutions — from the U.S. university system to the nation’s population of undocumented immigrants — are slowly eroding America’s greatness. With no (properly employed) facts or figures to support his blabber, these notions have been ingrained into the minds of these Trumpublicans (made that one up myself) through a constant stream of Fox News indoctrination. As we enjoyed the musings of Bill O’Reilly and Sean Hannity as background music while we dined, read, and chit-chatted, I learned heaps of information that wasn’t available to me in my Google News feed. Slightly strange, since it pulls articles from hundreds of reputable news sources. For example, I never knew that Hillary Clinton was running a money laundering scheme. What an unusual career aspiration, with the intense public scrutiny it involves, for a serious criminal like Sen. Clinton. It was also revealed to me that she has serious physical ailments, forcing her to occasionally sit down on a benches at rallies. I’m no expert, especially since“Papa Bear” didn’t mention it on The Factor, but it would appear that this sort of physical limitation is unprecedented for U.S. presidents. During a recent campaign speech in Charlotte, N.C., by far his most boring to date, dotted with the inevitable “establishment” rhetoric of his predecessors, Mr. Trump elaborated on his controversial plan for dealing with the fellow human beings who want to live in our country. Because I am not nearly as eloquent as the GOP candidate, I will treat you to a quick excerpt that I find particuarly relevant to this post. This part of his speech, and previous statements of a similar nature, really seem to have hit the spot for many GOP voters. Returning to my Texas visit, my Trumpist loved one and his/her counterparts didn’t seem too interested in talking about free trade, monetary policy, the humanitarian crisis in Syria, education or any other critical issue. The biggest issue for them appeared to be immigrants. Note that I use the word “immigrants” and not “immigration” because their concern was not how they arrived to the country, but how they acted once in the US. While it was a recurring topic in many discussions during my visit, the most enlightening example of this quasi-nationalist sentiment came when one of my beloved Trumpists received an unexpected phone call during dinner. Housekeeper: Good afternoon Mr. Trumpist. Sorry to bother you, but I wanted to let you know that I won’t be able to clean your home next week. Trumpist: Oh, that’s okay. Is something wrong? Housekeeper: No, not at all. My son is starting his first year of college and I want to help him move and make sure he doesn’t get into any trouble. He has a full scholarship and we can’t afford to lose it. Trumpist: That’s fantastic! Well, have a great time and I’ll see you in a few weeks. Well, yes — but she is an exception to the rule in the Trumpist book. She identifies herself as an American and loves the freedom and economic opportunity our country has offered her. However, the prevailing wisdom among supporters of Don Trump is that most immigrants come to this country to gorge themselves on food stamps, tax-free income, healthcare and drivers licenses. If they feel full, they stuff their suitcases with cash and leave, laughing the entire way home at what suckers we are for allowing this. If they don’t feel full, they establish themselves in isolated communities where they can speak their native language, enjoy their native cuisine and go on job-stealing sprees. Undocumented or not, they don’t care about the USA and have very little affection for Americans. This is the Trumpist sweet spot — the secret ingredient in his Orange Kool-Aid: Anger. I detest this type of nationalistic, xenophobic rhetoric, but even I’m not immune to it. Obviously the aforementioned Trumpist logic is almost entirely false, but there are indeed some people who move to the United States and do not embrace the values of this country and would rather be somewhere else. Before, this never bothered me — but when I was 21, I made the decision to leave the United States and establish myself in Mexico. I was not moved abroad by an employer. I didn’t move because of a girl. I wasn’t fleeing the long arm of the law. I moved out of a genuine love and passion for Mexico and the Mexican people. 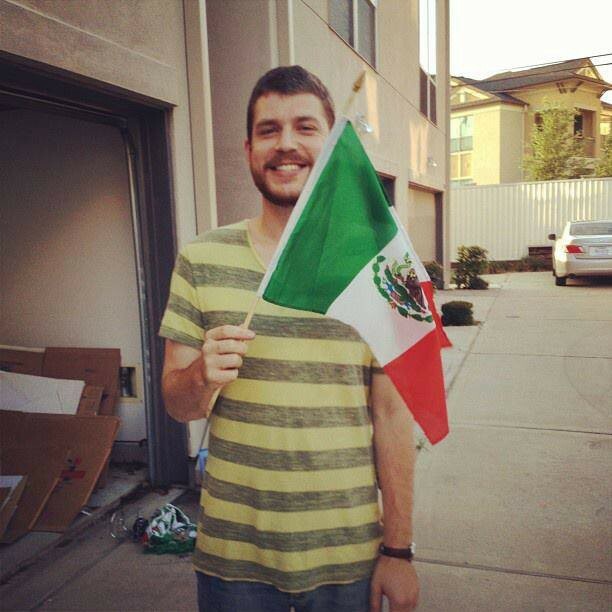 I lived there for many years, acquired a long-term work visa and immersed myself as much as possible in Mexican culture. I didn’t have an American expat clique, and I didn’t want one. I even considered applying for citizenship, but ultimately I returned to the States. It was one of the hardest decisions of my life. Assimilation is easy when you’re a privileged American fleeing a life of excess. I felt the same way about the Americans living in Mexico who surrounded themselves by other expats, only dined in American-themed restaurants and refused to use public transportation. I still believe that immigrants in any nation should do their best to incorporate themselves into society — but the notion that potential immigrants should be required to explicitly embrace certain “values” as a prerequisite for entry to the country is absolutely absurd. It’s a selfish, ignorant, knee-jerk reaction that in and of itself runs contrary to the current and historic values of our nation — a nation that has almost continuously admitted immigrants from all possible nationalities and cultural traditions. “Our society” and “our values” that Mr. Trump cites in his discourse are not static. They are constantly evolving social constructs that depend on immigration to enrich our national identity and strengthen our standing in the world. Mr. Trump complains about Hillary Clinton’s plan to allow more Syrian refugees into the United States. These are people who have witnessed their entire villages destroyed by regime and Russian airstrikes. People who have nowhere else to go except the overcrowded, disease-ridden refugee camps in neighboring countries. Immigrants, just like anyone else, are subject to the laws of the United States of America, none of which include “sharing our values and loving our people.” Immigrants who apply for citizenship take an oath to support the constitution and renounce allegiance to foreign powers. We don’t need anything else. Not everyone understands this context. When they hear Trumpist rhetoric, it’s hard for some Americans, especially those who have not been abroad or had much interaction with people from other cultures, to not feel upset or betrayed. It’s not always their fault. It’s up to leaders, like Germany’s Angela Merkel or President Obama, to stand up for what is right — even when it goes against the wishes of the electorate. Things may not be perfect — people may not always behave — but that’s why we have laws and a criminal justice system. So, is Trump right about immigration? If you’ve read this far, you already know the answer to that question. Of course we want people to learn English and incorporate themselves into our society, but the decision to do so is theirs and theirs only. Period.